Check out the results/race report of the 2018 Strade Bianche 2018, or read about the route and the riders. Saturday, 3 March 2018 - Dust whirls (or mud splatters) over the Tuscan hills. Strade Bianche is underway on twisting gravel paths, often firmly uphill. Riders toil on over eleven 'sterrati' - or 63 kilometres of dust (mud) roads -, while the total route amounts 184 kilometres. The start list of Strade Bianche features world class riders. Title defender Michal Kwiatkowski lines up with the likes of Peter Sagan, Vincenzo Nibali, Tom Dumoulin, Philippe Gilbert and Greg Van Avermaet. 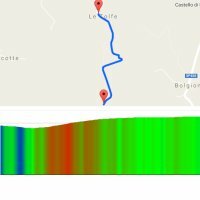 Cyclingstage.com brings you the riders that are competing the 2018 Strade Bianche. Strade Bianche is a fascinating mix of unpaved roads and short steep climbs. It doesn't happen often that both strong climbers and Classics specialists are among the favourites in the same race, but in the modern Classic in Toscany it is an obvious fact. Cyclingstage.com brings you the major contenders to win the 2018 Strade Bianche.